At the top: a purple glass star by Elizabeth Daingerfield Zwicky and a rainbow triangle. Mardi Gras beads. And the penguin from my 7/5/18 posting “The multi-speed rainbow buttlight penguin (in blue)”. The rainbow was an accidental effect. I’ve already posted, on 4/13/18 in “The Prodigal Tongue”, about Lynne’s book on “the fiction and reality of the special relationship between British and American English” (from the publisher’s description). A bit more to come soon. Some might recognize the tune from “Maryland, My Maryland” (the state song of Maryland); “Florida, My Florida” (the former state song of Florida); “Michigan, My Michigan” (often treated, erroneously, as the state song); “The Song of Iowa” (the actual state song); “O Parador” (the national anthem of the fictional country Parador in the 1988 film Moon over Parador); and more. Tannenbaum, Christmas tree, rosemary, Maryland, Florida, Michigan, Iowa, Parador — dactyls rule. 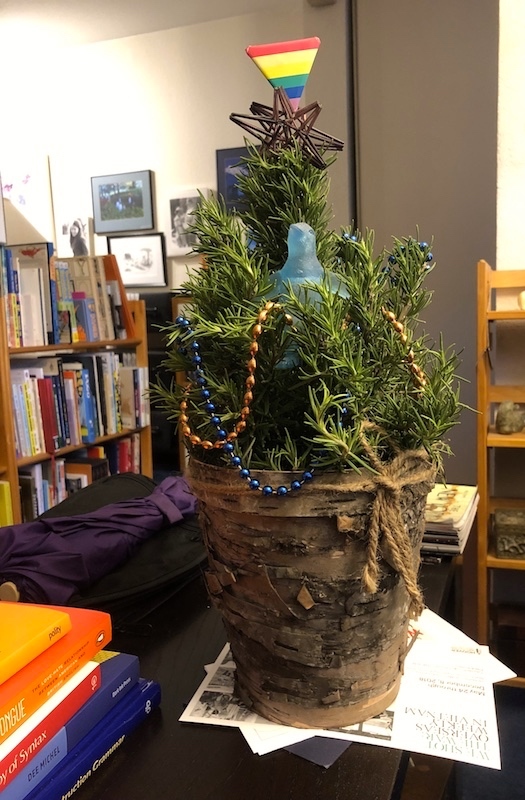 This entry was posted on December 7, 2018 at 7:03 pm and is filed under Books, Holidays, Language and plants, Music, My life, Poetic form. You can follow any responses to this entry through the RSS 2.0 feed. You can leave a response, or trackback from your own site. My mother had a plant that we called “the orange tree” (its provenance, and why it was called that, is a rather involved story); it was about six feet high (I think it would have been taller if it hadn’t kept running into the ceiling), and was sparsely adorned with thorns a couple of inches long, which along with the branches were suitable for hanging not-too-heavy Christmas ornaments. For a few years we used it alongside a regular conifer as a supplemental tree, and then my parents decided this was silly, and we just used the orange tree as a Christmas tree.